Maitland, FL- 4.11.19- Jewish Academy of Orlando (JAO) students develop problem solving and creative skills the Innovation Lab, an elementary Makerspace, and STEAM (Science, Technology, Engineering, Art, & Math) enrichment center. 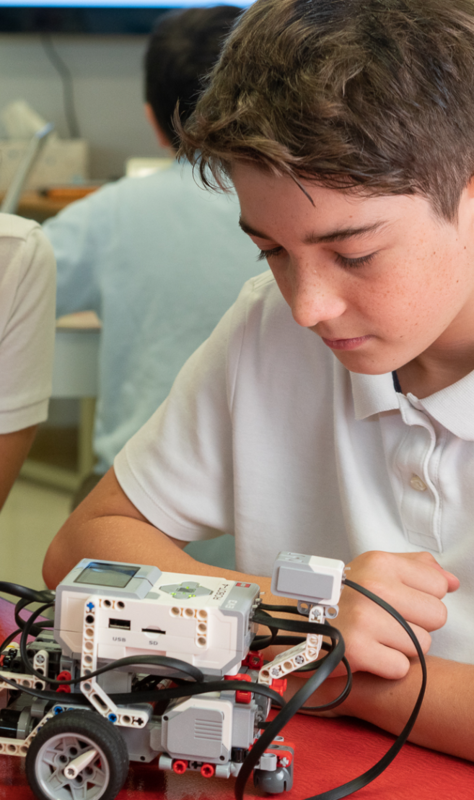 As part of the school’s curriculum, students learn the Design Thinking process, complete engineering challenges and pursue passion projects, using Computer Aided Design, Robotics, 3D printing, and coding. Through Design Thinking, JAO students learn to problem solve using an iterative process. Design Thinking utilizes planning, communication, collaboration, revision, and reflection. The process can be applied to all areas of academics and also used for personal improvement. The Innovation Lab (or “iLab” for short) is a space where students of all ages regularly complete engineering challenges and apply technology to various subjects. The Innovation lab is filled with age appropriate resources and materials students use to create, innovate, and problem-solve. The school integrates technology into literature by using robots for creative storytelling and the recreation of scenes from books they are reading in class. Starting in Kindergarten students learn to program robots and apply those skills to complete challenges. Next year, the students in the new Transitional Kindergarten will also experience the resources of the Innovation Lab regularly. Students learn programming concepts and begin to understand basic algorithms in kindergarten, by 5th grade students have a solid understanding of sensors, motors and practical application of robotics. Starting in 3rd grade students learn to use a computer aided drafting program to design objects in a 3D environment. Once they have successfully used the design process to create an object, it is printed using the labs 3d printer and the student takes it home. “The pride and sense of accomplishment the students display when they see their creation go from virtual to physical is amazing!” Hughes added. The Innovation lab is also a creative space where students can plan, design, and complete passion projects using state-of-the art tools such as robotics, programming, & 3D Design the students learn about electronics prototyping, Video and Music production, and engineering challenges.